As teachers and parents, we are always looking for new ways to incorporate different media into our kids' learning, and to get them to approach a topic from a variety of angles and think creatively. As more and more students are using the Internet as entertainment, blogs are the new medium of choice. Blogs can be a valuable tool in the classroom. Engaging with and writing a blog can help students improve essay-writing skills and critical thinking. Instant feedback in the form of comments and shares helps students to see how they are improving, and formulating information in a different way helps their memories retain what they need to pass their exams. 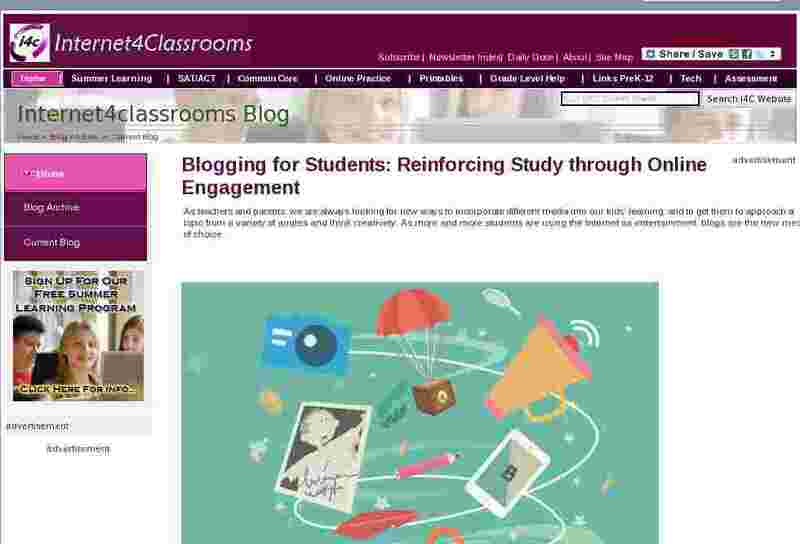 So how can blogging become part of your classroom curriculum? A blog is an online catalogue of thoughts, ideas, lessons, articles, images and opinions. Any topic a student is interested in, they can find a blog about it: football, scrapbooking, horses, fashion, beauty, cheerleading, roller derby, reading, music - there are blogs dedicated to all these topics, and more. A blog contains articles - called "posts" - unified under a common theme, like a magazine. Except, unlike a magazine, a blog can be updated daily, and the student and their peers can interact on the blog by posting comments, sharing the articles and sometimes even contributing their own work. Before you start taking a look at blogs in the classroom, it helps to familiarize yourself with some of the more popular ones out there, especially the ones your students might be interested. Google "blogs" and a particular subject matter, or ask your students which blogs they read and what those blogs are about. Style Rookie - fashion blog started by 11-year-old Tavi Gevinson, who has gone on to work with top designers, meet the editor of Vogue and become the editor-in-chief of her own magazine. The F bomb - a blog about feminism for teenage girls, created by writer Julie Zeilinger when she was a teen. Spencer Tweedy - Son of Wilco's singer Jeff Tweedy, Spencer's blog documents his own musical projects, beautiful photography, and some of the highlights from his life. LibDemChild - A fourteen-year-old girl's take on politics is currently ranked in the top 30 political blogs in the world. Setting up a blog is quick and simple. There are tons of free platforms that allow a student to set up a blog with their own URL, such as wordpress.com, tumblr.com, and blogger.com. Any student with some level of computer literacy will be able to follow the instructions on these sites and set up their blog. The student will need to think about what they want their blog to be about. Will it be related to a particular class assignment or project? Will it be a collection of their random thoughts and photographs? Will it be a diary of their life? A blog can also be used in class as a unique way. For example, an English class working on a Shakespeare project might like to create a blog with posts written by different characters from the plays, each post written in that character's voice and about a topic that would interest them. Use the Start a Blog guide on First Site Guide as a jumping-off point for setting up the blog. With appealing visuals and a simple, step-by-step format, this guide walks a student through the entire process of setting up a blog, writing articles, finding an audience, and promoting it on social media. Get your students to write about what they are passionate about! Whether that's ice hockey or baking or books or video games, use their interests to engage them with the blog format. Students don't have to be brilliant writers to create great content for a blog. They can also take photographs, shoot video, make infographics or even compile lists of their favourite things. Make sure your students are aware of safety on the internet. They shouldn't give out their real names on a blog or any information enabling. Many student bloggers will post pictures, but make sure the pictures don't contain information such as house numbers - anything that might enable someone to track down the kid in real life. Make sure students post to their blogs regularly - perhaps once a week. Blogging regularly - especially on topics related to studies - can help kids retain information and hone their writing and communication skills. If you're looking for a new way to engage students with subject matter or help them improve their communication skills, consider working with them to start and maintain a blog on a topic you enjoy. You never know what their blog might turn into! Acknowledgement: This month's guest blogger is Ogi Djuraskovic from First Site Guide.